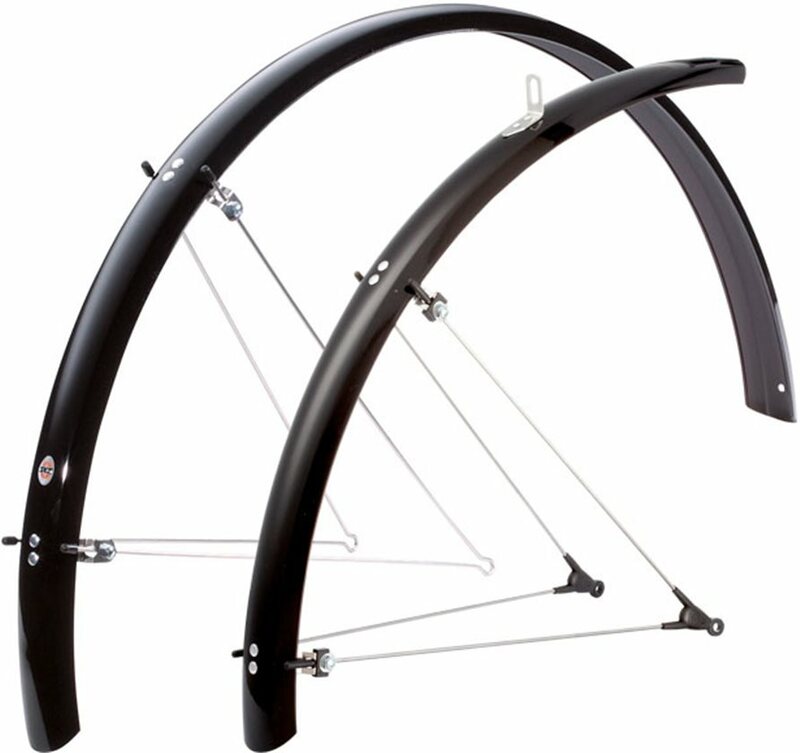 It's probably pretty obvious from the name that SKS designed their Commuter II fenders with commuters in mind. The Commuter II is an economical fender set that is built to withstand daily use. This classy set of fenders attach via sturdy stainless steel stays and are easily mounted with the included hardware. Sold as a set (front and rear fender). The only significant challenge setting these up is cutting the struts to length. After trying a few tool with no luck, and getting a bad cut on one with a hacksaw, I finally got out my angle grinder with a metal cutting wheel. That did the job very handily, cutting quickly and precisely. Once installed well, these are fairly light for full coverage fenders, look good, and do the job very well. I have 28mm installed. My 32mm touring tires don't fit (too tall off the rim, not too wide though, so I think that's more about my fork then it is about the fenders). 30mm would probably fit fine even on my fork, because the 32mm were just barely too big. I put these on 26" wheels with 1.5" tires. Installation was a bit complicated but the result is a sturdy and precise fit. The stay caps(stays are the long wires) are a little confusing to install, put the long piece through the metal tab on the fender then push the square part of the cap onto to edge of the tab. Leave the bolts on the stays loose until the fender is lined up then tighten them. These are definitely not easy to install, but well worth it once you are done. I cut the stays with bolt cutters after carefully marking them, then cleaned them up on a bench grinder. They are solid and look great on my commuter/touring bike. I used the B53 made for 700C for better coverage, which just barely fit the front fork. These are the modern version of the 70's vintage Bluemels on my road bike. Wanted some discrete fenders for my rig, these mounted pretty nicely to a surly straggler, but couldn't mount the front near the dropouts because of the disc brake. The fenders are as promised. Light, sleek, and pretty hard to fit on a road bike designed without fenders in mind! My challenge was at the front fender where I had to file away some excess fork steel under the mount for the front brake. The clearance is very tight. I worked it out, but it's more than a two beer job. I mounted these to a Trek 1.2 with 28mm Conti 4 Season tires, which I've rebuilt with 105 components into a great winter/rain bike. It was one of the most tedious tasks I've ever performed on a bike, but they work great. The instructions are not good, and Jenson tech support were polite but not knowledgeable about this product. As you might guess, I found the solution on YouTube in a video entitled "Fender Install by Rivendell Bicycle Works". The key to fitting these fenders is that you have to cut the stays to fit your bike, but please don't screw it up and then try to return the product. I also got prompt help from SKS by filling out a contact form on their web site. A rep from the US office emailed me the next day and was extremely helpful. There's nothing as effective as full fenders, and these have great coverage. They're light, discrete and look great on a black bike. I don't notice any aero deficit either. Great value. Nice fender set at a great price. The plastic tips for the braces are a bit tricky to install, but other than that they went on easily and fit well. The screw supplied with the fenders are not properly sized for the fenders nor my bike. The screw has a tendence to work its way loose. One of the screws holding the rear fender bars came off while i was riding my bike during an event; while i was traveling about 12 miles per hour, casuing the rear fender bar to get caught up in my rear gear. I crushed my bike and suffered some injuries. For this reason i do not recommend this product. I strongly recommend that you invest in a slightly more expensive, safer and better quality product. My bicycle's tire is KENDA 700x25c, K152. Does it fit on my bicycle? Will these work with disc brakes? BEST ANSWER: Yes, I can't remember if these come with a disc brake spacer kit, but if they don't you can buy one so so you don't have to bend the stays around the caliper body, go for about five dollars online, or just go to your hardware store and find something comparable for a fraction of the cost. Basically a cylindrical spacer 1-1.5 inches long that you can put a longer fixing bolt through to thread into the fender eyelet. Yes, no worries. My commuter worked as is. They also include spacers in the set-up parts to accommodate different configurations. Do these fit 27 inch wheels? BEST ANSWER: Yes, they will fit 27 inch wheels if there is standard clearance between the frame and the tire. 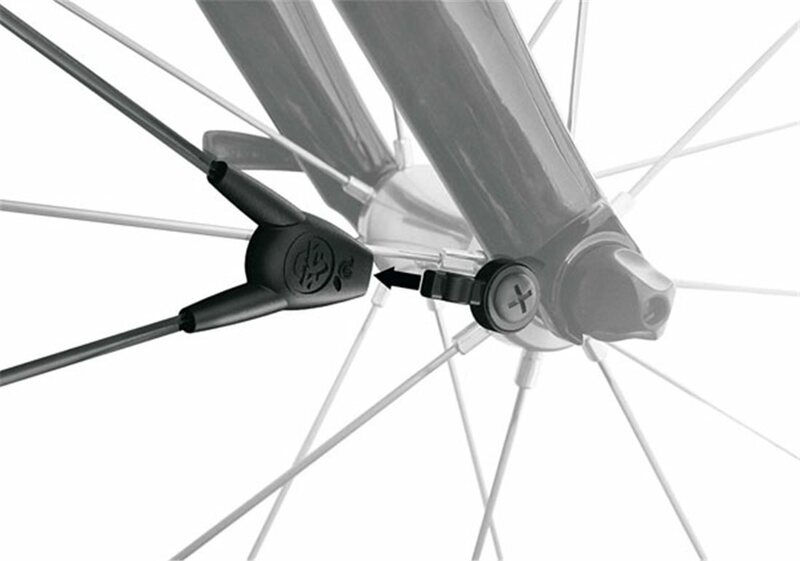 The fenders will limit the upper end of tire sizes that you can fit on your bike. What are the dimensions of the fender? I tried a fender made for a mountain bike and it was too wide for my bicycle frame. My wheels are 700 x40. BEST ANSWER: My fenders are 45 mm wide when measured at the bracket straight across from edge to edge. They're made of plastic-coated thin aluminum, stiff but flexible. You can squeeze them into a narrow fork if need be. I've mounted them on 2 different road and 'cross bikes. They're pretty easy to mount and remove. They are fantastic for the money. The instructions are lacking. Just remember you have to cut the stays to fit your bike. You'll need a hacksaw or bolt cutters. Mount the stays, mark them, then remove them, cut them and remount. The fender it's self mesures 2.5" if this is too wide. maybe look at the bluemels line up from sks they are 45mm wide they claim to be for a 28" wheel but that's the same rim seat as a 700c. They are pretty wide. I have them on 700x38s and there is definitely more room. The tricky thing is that my frame is tight, but if you have room to fit them in your frame, they are great. Will these fit a 26" wheel bike? BEST ANSWER: The set I ordered was for a 700c (29") bike. I would think the profile would not match the 26" configuration. If you use the drop down menu and chose the 26" option then yes up to 2.1" tires. is there any reason why 26x1.6/2.1 would not fit well for 1.5" width? Can someone please tell me it the 700 size will fit a 28" wheel? Thank you!